Face it, some rummy games are just unwieldy, in terms of the number of cards you must keep in your hand. If you're not careful, it's easy to lose track of cards or get them mixed up. And if you're in the middle of an epic match, your hands can get tired from holding all those cards! The answer? A playing card holder. It holds the cards so they're easy to read, easy to sort, and easy to grab. 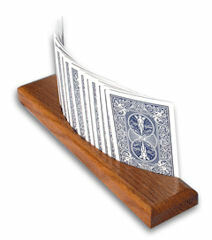 Here is one of the simplest and most elegant playing card holder we've seen. It's called Angie's Playing Card Holder, and it comes with a set of four wooden holders. Each is crafted from solid oak and is polished with a beautiful varnish finish. Each holder features a curved playing card slot, which holds your playing cards at an angle, keeping them hidden from your competitors, yet totally visible to you. Angie's Playing Card Holder can hold up to about 30 cards, and works great with any game that requires you too keep a lot of cards in your hand, especially multi-deck rummy games.